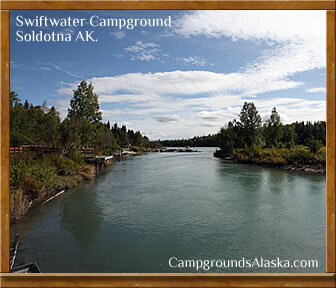 Welcome to Swiftwater Campground in Soldotna AK. Swiftwater Campground in Soldotna AK. Located at 675 Swiftwater Park Road in the city of Soldotna behind Fred Meyer's, Swiftwater Park is a fee-based, public-use park and campground designed with the outdoors in mind. A fisherman's paradise located in the heart of the best sockeye and silver salmon fishing on the Kenai River; Swiftwater campground gets pretty popular around salmon fishing time on the Kenai River. Directions - Located at 675 Swiftwater Park Road in Soldotna just a short distance, about 600 yards, down East Redoubt Road that winds back behind Fred Meyer's to Swiftwater Park Road. Turn right and follow the road to the toll booth at the en terence to Swiftwater Campground. Description - Swiftwater campground in Soldotna Alaska is one of the locals favorite campgrounds on the Kenai River with bank fishing and river access in Soldotna. What would camping on the Kenai River be without bank fishing access and Swiftwater Campground has plenty of that. Check out Swiftwater Campground for some sockeye and silver salmon fishing when camping on the Kenai Peninsula in Alaska. Water - Yes but no hook-ups at sites; no problem, it's Alaska Boondocking Time. Sewer - Dump Station located near entrance ($20.00) and another close by at the south side of the Fred Meyers parking lot in Soldotna AK. Services - Honey Holes with Lids. Additional Amenities - Raised fishing platforms on roughly 800 feet of boardwalks, boat launch, tables and fire-rings, . Payment Methods Accepted - Cash at toll booth. 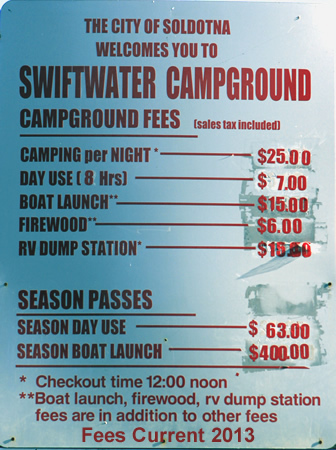 Swiftwater Park Camping Fees follow for the whole schedule updates for 2016. The updated photos of Swiftwater Campground in Soldotna AK were taken on Saturday, July 27, 2013. The campground was full and the fishermen were all doing very well with lots of sockeye jumping in front of the fishing walk at the park. The upper loop at Swiftwater Campground is better suited for trailers and longer RV's but only a couple sites can handle the full size Class A motor homes. Be sure that there is a site that is long enough and level enough before filling in and paying the camping fees. Campsites are rough and very uneven. Note: Swiftwater Campground is for the most part a tent or small RV campground that is less than adequate for full size RV's. The better option for big rigs is found in Centennial Park Campground on the other side of town or at King Salmon Campground just a couple miles away on te Kenai Spur Highway.